Easily serve your delicious sides and entrees in your banquet hall or buffet with this 4" full size standard weight economy steam table pan. Built from sturdy 25 gauge 18/8 stainless steel, this product is impact resistant, so it's sure to stand up to long-term use in your commercial environment. 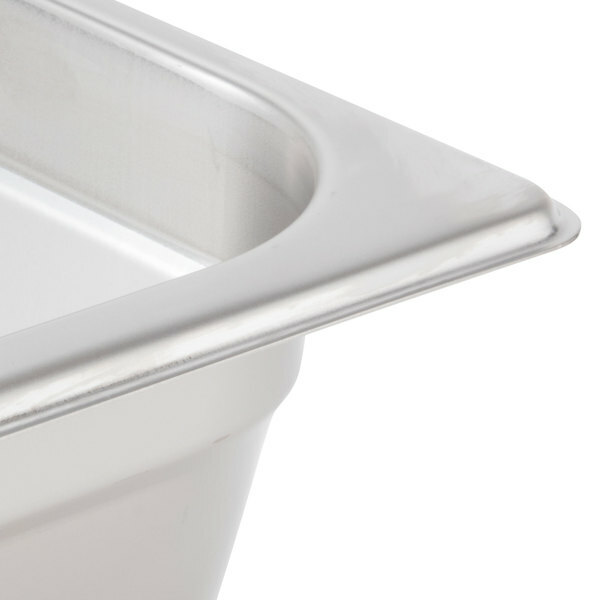 With its ability to go from freezer to oven to serving line, this steam table pan is a great option for buffet lines and catering events due to it's versatility. Place this steam table pan inside a compatible chafer for guests to make their own plates, or use this pan to store and cook your various ingredients and recipes. Extremely easy to clean and maintain, at a very affordable price, this steam table pan is a convenient option for your busy business! We bought these pans as a bottom pan for our French fries under the heat lamp food warmer. Very good pans for the money! Excellent shipping. We wished you offered free shipping! Thank you for your review! Although not every item we offer has free shipping, we do offer provide free shipping on many products. Look for the free shipping flag located above the price to know if the item you are purchasing ships free or sign up for our Web Plus program! The full size hotel pan is a very important item in the commercial kitchen. These 4" Full size pans are strong and affordable which makes it the perfect item for our kitchen. We use the full size 4 inch deep hotel pan for everything from holding entrees in the steam table to roasting chickens in the oven. Easy to clean and great price. Very durable and light weight design. Our restaurant mainly fries food and we place around 10 pounds of half-fried french fries in this pan under a heat lamp until they are ready to be fully cook for a customer. Combined with a footed cooling rack, this pan is perfect for cooling off big amounts of fried food that allows the oil to drip into the bottom of the pan. The material that the pan is made from allows for easy cleaning and any oil just washes away painlessly. These pans are the best.I have used the everyday for 3 years and they have held up well.Great price and we'll worth the money.I recommend these. These are the best ever food warmers. I purchased around 12 of these for my luau's. Now im getting ready to use them for my 50th Birthday Celebration in January 2017. Straight forward design. Exactly whats needed. Was durable under high heat of the grill. If you stable this is the pan that is needed. Straight from the smoker to the chaffing dish. These hotel pans are a thinner guage stainless steel, but serve their purpose well. They are exactly as the specs state they are and are nice looking on our banquet lines. This is your standard deep hotel pan. We use these in the drawers of our sandwich prep counter and they fit perfectly. They are sturdy and well made. We handle large groups at our retreat center so we use a lot of 4" pans like this. It's a great must have item that will do the job. this has two functions in our kitchen, one is that it holds our ice with a clear top lid for quick ice runs, and second as a steam table pan full of water for other inserts. Perfect. I love using these pans in my oven for roasting veggies. Easy to clean and we love the stainless steel option with no yucky nonstick toxic coatings. These are a very nice quality for the price. They have held up to the use we give them. They don't get bent up with normal use. This pan fits nicely in a steamtable set up, but it's also great as a braising pan. It can safely hold several pieces of meat and enough liquid to submerge them. Also, the thinner gauge cools down quickly after it comes out of the oven, which is a plus in my book. These pans are very economical, obviously, and deserve credit for being a good product at an economical price. Note, however, that these pans do tend to stick together when stacked (which more expensive pans do not tend to do) and they dent very easily if used in a heavy duty application. With that said, if the application is not heavy duty and you do not need to stack many when storing them, it's a great product. These are good but if I had the money I would get the anti-jam ones for a bit more money. These are tough to pull apart. Use these for produce drawers in my Avantco Double door fridge, They fit perfectly in the rails underneath the shelf's, and pull in and out flawlessly while maintaining a professional looks and being easy to clean. This 4" full size pan is great. It very durable, I used it everyday for my fried rice and it is very easy to clean. Stackable and plenty heavy. Why pay more? We use them as water trays over sterno for full-size foil pans of food. They're sturdier and better looking than foil. They fit perfectly in a standard wire chafing rack. Worth the money since it's made of metal and nothing else, but not the sturdiest for heavy items especially if you hold it from the corners diagonally. Good for most everyday usage. These steam table pans are great! There is no reason to buy the more expensive options. .These hold up well and are very durable They are easy to clean! I use these for food storage and they work very well! High quality and durable! Very easy to clean and I love that these bins are stackable! 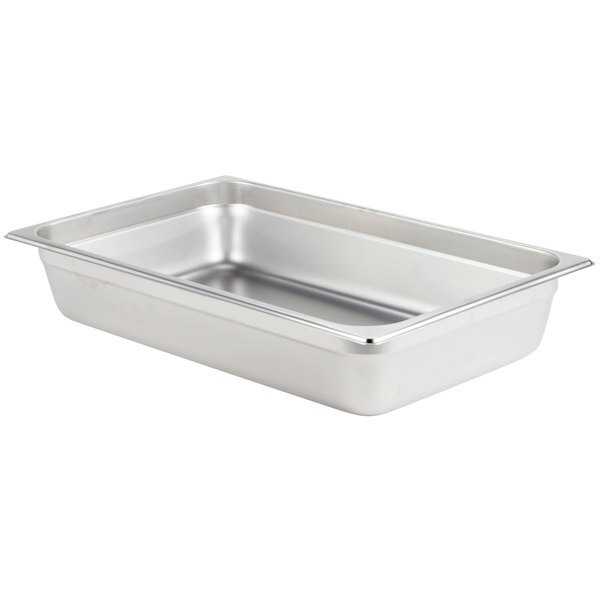 Sturdy stainless steam table pan for a great price! Four inch depth works really well for serving a crowd, will buy more when needed, thanks! Theses pans are a great value for the money. Fare more durable than the foil ones i used to use. Along with the liners, this pan make clean up easier and i save money in the long run. Nice quality pans and a great price. Also purchased grate as these are ideal for french fry 'bins'. Buying more for friends that 'eye' mine. Excellant product for the price. We use these everyday to feed 150+ children at schools and they are well worth the money. Pricing is the best I could find on the web including Ebay. This four inch full size steam table pan holds a lot of food in my steam table. I can count on them to keep the food hot. 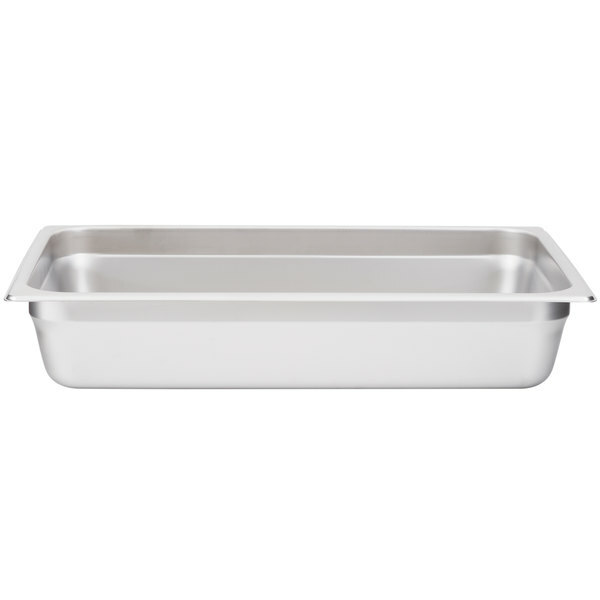 This steam table pan is a great item for the price... It is durable and a nice weight. I would buy this again if I need more of them! As always, this was just what I was looking for. Great quality and great service. It's always a pleasure shopping here at the Webstaurant store. 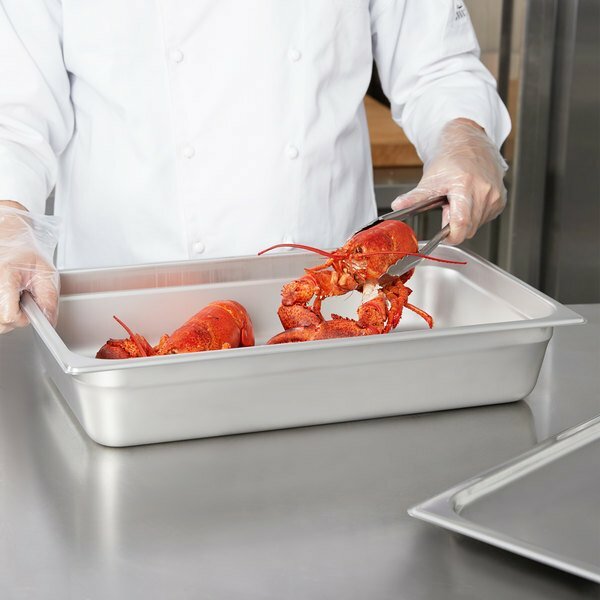 No kitchen is complete without these full size, 4" deep steam table pans. The weight of the stainless is a bit lighter than expected, but they pans are still pretty durable and definitely get the job done. I might go for a heavier version with my next purchase, but for light or home use, these pans are perfect.